Metro suspended rail service between Foggy Bottom and Federal Triangle so crews can repair a track after an early morning cable fire that caused single-tracking and delays throughout the day. 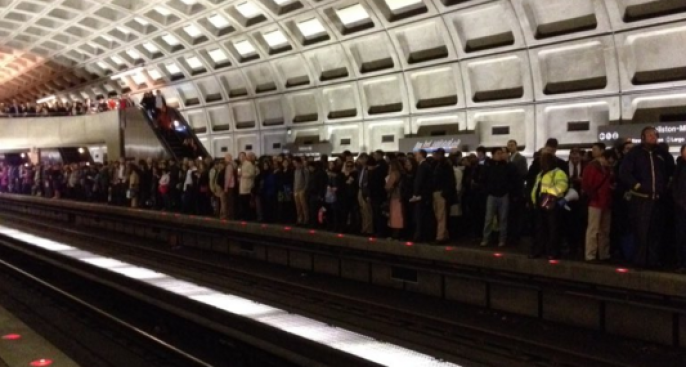 Metro expects to restore full service when the system opens Tuesday morning. Shuttle buses will run between the affected stations. Blue and Orange line trains single-tracked between the Foggy Bottom and Federal Triangle stations Monday, and during the evening rush, eastbound trains on those lines skipped Farragut West and McPherson Square to reduce delays. Silver Line trains ran between Wiehle-Reston and Ballston only with riders required to transfer to the Orange Line to continue their trips. Metro CEO and General Manager Paul Wiedefeld apologized for the situation. "Unfortunately, the fire damaged several cables that will need to be replaced tonight in order to restore full service for tomorrow," Wiedefeld said in a letter to riders. The disruptions happened after a cable fire left smoke in a tunnel at the McPherson Square station early Monday. The station was temporarily closed to riders after the fire. Then eastbound trains, and later westbound trains, bypassed the McPherson Square and Farragut West to reduce delays. Riders were told to expect delays of 30 to 60 minutes. Commuters were encouraged to seek alternate routes. "We are working closely and cooperatively with the NTSB, FTA and DC Fire Department to determine the cause of this incident, and I will remain personally engaged in our response," Wiedefeld said in his message.